Our Flagship product! 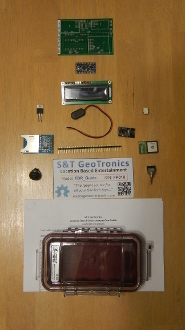 This kit allows the user to build, among other things, a fully functional multi-stage Inverse Geocaching device. Comes with detailed Assembly instructions, complete with pictures. All you need to add is your case, whether you want to use an Ammo can, a lock n lock container, or like us, a Pelican 1015 case. You will also need an FT232RL USB to Serial Adapter to reprogram the Arduino Pro/Mini. Picture shows optional Pelican 1015 case as an example. None of our products come with batteries.